Order picking is the process of finding and extracting products from a warehouse to fulfill customer orders. Since the order picking process involves significant cost and can affect customer satisfaction levels, there has been an increasing number of improvements proposed to help companies with this supply chain issue. Choosing an order picking system depends on a number of requirements, including cost, complexity, the volume of customer orders, and the size of items and orders. Every company has unique requirements, and one order picking solution may suit one business and not another. The picker-to-part method is commonly found in many warehouses. The process involves a storage area, a picking area, and a material handling system that refills the picking locations from the storage area. The handling system can be forklift-based or more specialized, such as gravity flow racks. The picking operators get the items to fulfill each customer order from the picking area. Since the items are in a smaller area than the general storage area in the regular warehouse, the picking operators can fulfill the order more efficiently. There are a number of technological advances in picker-to-part processes, including pick-to-light or voice picking systems. Pick-to-light systems inform picking operators of which product to pick by shining a light on it. Voice picking systems let operators know which items to pick via headsets. The part-to-picker method uses the same elements as the picker-to-part method: storage area, picking area, and a material handling system. The difference is that the picking area for this method is made up of a series of picking bays. Products are moved from the storage area and delivered to the picking bays. Each bay receives the items for one or more orders. The picking operator then collects the products after they're delivered to their bay and fulfills the customer orders. This method can cause wasted labor because picking operators may find themselves waiting for items to be delivered to their picking location. The sorting system method uses an automatic material handling system consisting of multiple conveyors and a number of sorting devices. The items are placed on a conveyor in the storage area, and they're sorted for each particular order. The operator in the picking area collects the items that have been sorted for a customer order and processes that order. This method can be more efficient because the operator does not have to take the time to collect individual items. 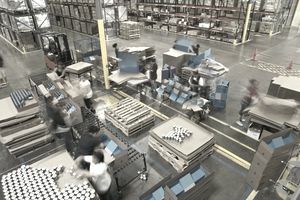 The pick-to-box method is similar to the sorting system because it uses the same elements: a picking area, a storage area, replenishment of the picking area, and a sorter. The picking area is organized so that there are a number of picking zones connected by a conveyor system. The operator fills the box with the items on a customer order, and the box moves to the picking zones until the customer order is complete. It's then ready for shipment to the customer. The operator does not have to consume time collecting individual items, but the cost of the initial set-up of this solution could negate any cost benefits that the efficiency of the solution offers.